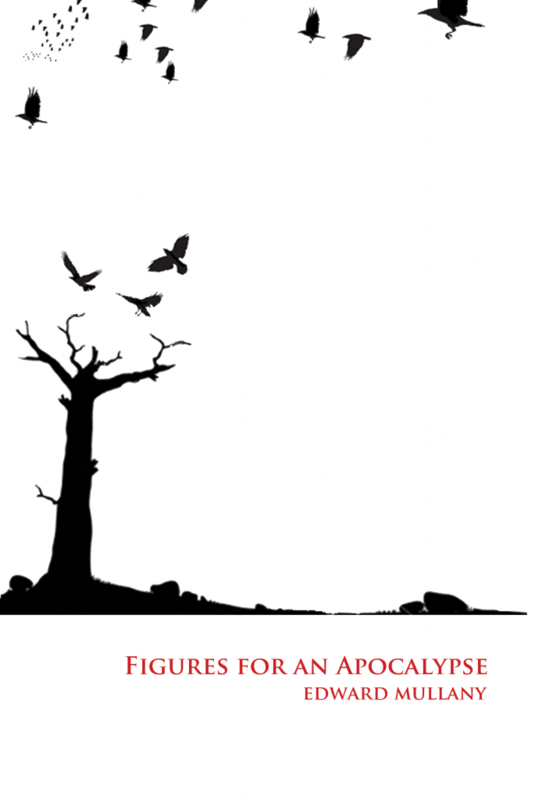 I was gratified to read Edward Mullany’s new book Figures for an Apocalypse specifically because of his treatment of that Biblically charged word. Often I hear or read the word apocalypse bandied about as a stand-in for the end times, a word to signify the destruction of everything, specifically mankind. But this is a mistake of association. The word is charged with this meaning because it’s actually the name of one of the books of the Christian Bible, what we call today Revelations. Apocalypse, in its literal translation, means Revelations. Because the book of Revelations is about the end times of mankind and his rule on Earth (and there already is a word appropriate for this definition: Armageddon), its gaze points to the future, to sliding across the veil and describing what is to come, literally to reveal what is yet unglimpsed by man’s eye. Mullany’s book, then, is titled with the knowledge and cunning that comes from knowing our words, where they come from, and most importantly, what they do mean and what they can mean. Mullany wears his references openly with epigraphs from the book of Revelations that start the first two of the three books of his tome (Book III gets an epigraph from “the Acts of the Apostles”). Mullany is not out to share his vision of the end of the world (which would necessitate a doomed comparison to that devastating scripture). Instead, I would argue, Mullany shares his vision of an end of the world, with one’s definition of “the world” open for healthy debate. The titles alone are a phantasmagoria of foreboding images and suggestions. Dopplegangers, people without faces, birthmarks, amputated limbs, levitating shopping malls, men and women who are described doing or being any number of unnerving things like collecting teeth or jumping to their deaths or refusing to kill their children (that last one looks like a typo, but it’s not). I laughed the first time read that. It has all the markings of a good joke, right down to the line break as an effective form of timing. But upon revisiting the piece two, three, four times and more I became more and more uneasy, the humor replaced with a disquiet that I think is central to the humor but also persists after the joke fades. The longest story in the collection, “Contagion,” is two complete pages in length and therefore too long to reprint here, but manages to tell a complete and chilling story including a small, complex cast of characters. Robust, when viewed in the context of the concise pieces that surround it. The story can be summarized as easily as “Tammy’s father takes her to school today,” but the added length here affects a creepy tone, one that capitalizes on the contextualization of all the other pieces that shape a sinister and unsettling landscape for this to happen. In between are one sentence stories, a succession of longer imagistic prose that follow repeated line break patterns, and a few outright horror stories only fifty words long. But beyond form, there’s the tableaux of images one could spend months cataloging and deciphering. People, animals, crimes, places, events, and nightmare fuel, all appear in dozens of iterations, varied and powerful. Both the content and execution of the book are potent, and they have to be, because they are delivering, not only an Armageddon, but a series of revelations to the reader. Sometimes the revelation is what the story is about. A character, or even mankind as a whole, comes to a revelation from witnessing or participating in one of the many foreboding events in the book. But more often than that, the story is nothing more than itself, and so then the revelation belongs to the reader. As my experience with the joke in “The Propaganda,” I had a moment of getting it that made me laugh, but then my understanding of the story changed. It grew deeper as I revisited it and considered it in the larger context of the book. The use of the passive voice, the attention to penmanship, to surface, appearance, the lack of substance and it is the shortest story in the book, etc. The more I thought about it, the more I turned it over in my mind, and the more I realized what a cunning and illuminating piece of fiction those eight words are. Most of the stories in this collection are crafted to this very effect, revelation in the reader. I felt it, perhaps most sharply, in the instances where I didn’t get it at first. If there is no spark, no tingle of the hairs on the back of the neck, then s piece only half a page long, or even shorter, can feel disappointing, like a magic trick that’s misfired. I attribute some of my own missed starts with a lack of total familiarity with the Bible (and the book of Revelations in particular), but I also recognized that like that mystical text, it is not something that can or should be completely known on its surface. Part of the experience of revelation is the mysterious, an acknowledgment that one doesn’t know everything and that understanding comes with work and even, yes, sacrifice of a kind. Mullany’s figures for his specific brand of Apocalypse are intricately layered to excite and disturb on a surface level, but given time and the deep gaze of an attentive reader, they transform into a startling vision that sees things of which we should be made aware.